I love to preach Psalm 102 which I call the “Holocaust Psalm.” Before Israel became a nation, one could claim that her judgment was permanent. However, since 1948, God has poured out blessing and favor for 65 years. The exiles have returned (and are returning), Jerusalem is back under Israeli sovereignty, God has miraculously protected and delivered them in multiple wars, and He has blessed them with massive newly discovered natural resources and technology. ​Trillions of cubic feet of natural gas are now flowing into Israel from vast fields offshore in the Mediterranean Sea. Also consider that “Approximately 20 percent or 1 in 5 of Nobel Prize laureates are Jews, yet Jews make up less than 0.2 percent of the world’s population.” (Israel Today) FAVOR! While the world succumbs to the dark scourge of radical Islam, Israel is shining brighter and brighter. And as I said in my previous blog, “Those who bless Israel will be blessed, and those who curse Israel will be cursed.” As for me and my house, we will serve Yehovah, God of Israel, and His eternal covenant purpose to bless Israel. Don’t forget that the word salvation in verse 13 above is Yeshua, the Hebrew word for Jesus. 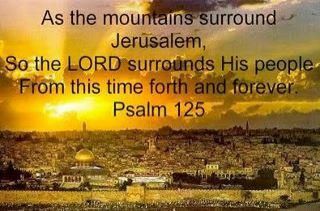 Jesus is the “salvation” placed in Zion for Israel.